Posted: Saturday, February 6, 2016. 2:13 pm CST. By BMG Staff: The Belize Sugar Industry, BSI/ASR in collaboration with the Sugar industry Research and Development Institute, (SIRDI) held a session with sugar cane farmers to demonstrate mechanical harvesting. While stakeholders in the industry agree that this harvesting system is definitely a part of the future, how practicable is it for the producers? While BSI representatives say that farmers want to learn other harvesting techniques, the mechanized system brings with it both benefits and challenges. Presently, BSI is the only producer that employs the system, harvesting up to 30% of its production this way. The factory does not own a harvester. The machines are the property of Northern Enterprise Company Ltd, owned by Alexis Torres and his brother. The one used in today’s demonstration was brought in the country in 2006/2007. It works by using base cutters at the bottom of the machine to chop the cane at the base and then sends it into choppers that cuts it to different sizes which can be loaded straight to a delivery truck. BSI’s experience with the system is that cane can be cut green or burned and in almost any weather condition. It is also cheaper and fast compared to manual cane cutting. Enrique Rivas, harvesting operations officer for BSI says that in their experience they can harvest between 25 to 40 tons of sugar cane an hour, saving somewhere between 10 to 15 dollars per ton of harvested cane. Of course, this all depends on the conditions of the field and the day. 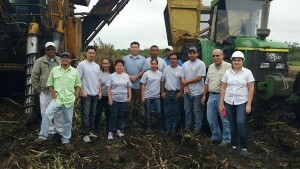 The cane harvested is also cleaner, “because men can select the cane, bundle loaders can do a much cleaner job for you,” said Rivas. So what does this all cost? The machine alone has a price tag of no less than US$125,000 and operators have had to undergo special training in the US at the John Deere Headquarters. 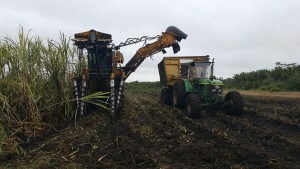 To get the harvester to a field alone costs $60,000 and that is not factoring in the cost for harvesting an acre of sugar cane. Torres says the cost per acre varies on several factors and these differ from field to field. Stones and debris have seen the company hiring experienced help from abroad. The delivery system in the country may also present a challenge for its adoption. Modoesto Ulloa, consultant for BSI/ASR says the delivery would have to be continuous in order to be cost effective. The factory would have to receive 4 to 5 hundred tons per day by this system alone which would “require tremendous partnership among farmers,” Ulloa adds. Where does this leave cane cutters? Cane Farmer Relations Representative at BSI/ASR Olivia Avilez says the intention is not to replace cane cutters but merely to compliment their work citing, “sometimes we have to bring immigrants to work and we don’t want to do that, we want to be more efficient in the activity; it can reduce cost as well…it is just one type of harvesting”. Research Coordinator at SIRDI, Adrian Zetina adds that they “are trying to move it to a more efficient system where we could eventually create different skilled, higher paying jobs where some of these guys slide into”. It is an option, he goes on to say, that can allow farmers to remain self sustainable and competitive as it lowers costs at a time when production costs are continuously going up. The system is an option being well received by some farmers report BSI officials and some are cognisant that there needs to be major reform in the industry for it to work properly. During the event, farmers attended sessions by technical experts.